What are the alcoholic beverages suitable for consumption by a Kshatriya? What about other three varnas? Are they allowed to consume alcohol? Then remains the case of Krishna and Arjuna being drunk with wine, ... being [an] instance of [a] direct transgression of the law. But it is only the wine distilled from grains, which is called "Sura," that is prohibited for the three higher castes; says the Smriti: "Sura is the impure essence of the grains at it is spoken of an impure; hence the Brahmana, Kshatriya and the Vaishya should never drink Sura." As for the particular wines "Madhu" (wine distilled from certain fruits, as grapes and the like), and the "Sidhu" (that distilled from molasses), these are not prohibited for the Kshatriya and the Vaishya, as "all intoxicating drunks" have been prohibited for the Brahmana alone. Though there as a passage that declares - "all the three kinds of wine, the Gaudi (that distilled from molasses), Paishthi (that distilled from grains) and Madhvi (distilled from fruits), being the same, they should not be drunk by the Brahmavadis," - yet here the word "Brahmavidi" should be taken as denoting the Brahmanas only, as the word literally means "one who is capable of teaching Brahma", or "whose duty it is to teach Brahma", or "whose excellence lies in such teaching", and as the root "Vada"' is synonymons with "Bru" such duties are distinctly restricted to the Brahmana alone, by such texts as - "from among the three higher castes, the Brahmana, alone should teach". And it has also been pointed out in connection with the vilificatory Arthavada, that are taken along with the prohıbıtıon of wınes ın general, that the Brahmana, deluded under the influence of wine, might do many such things as should not be done which shows that wine in general is prohibited for the Brahmana only. Hence we take the passage-"All the three kinds of wine, &c.," to mean that just as the one, Sura distilled from grains, is not drinkable by the three higher castes, so are all the three undrinkable by the Brahmana. Otherwise, if the sample prohibition of wine in general were meant, then the words "Yathaiva, &c.," and "Brahmavadibhih" would be totally redundant. The mention of "the three castes" we shall supply from out of another verse. For this reason, the fact of Krishna and Aruna - both Kshatriyas - being intoxicated with Madhu (grape wine) is in no way a transgression of the law. And, as a matter of fact, we have Vedic texts that distinctly show (1) that the prohibition of wine is for others (i. e., Brahmanas), and also (2) that it is distinctly permissible (in the case of others). For instance, (1) "That which was impure came out afterwards, wine is that ampurity, this became attached to the Kshatriya, hence it is that superiors, daughters-in-law, and the father-in-law drink the wine and go on talking; evil indeed is impurity, hence the Brahmana, should not drink the wine; lest he be attached to evil", and (2) "The Kshatriya should say to the Brahmana - the drinking of wine does no harm to him who knows this", and this latter is with reference to the "Madhu" and the "Siddhu" (and not the "Sura" which is in no case allowed to anyone else but the Shudra). So to sum up, Brahmanas are not allowed to drink any kind of alcohol, whereas Kshatriyas and Vaishyas are allowed to drink Madhu and Siddhu but not Sura. But Sura can be consumed during certain Yagnas, like the Sautramani Yagna. 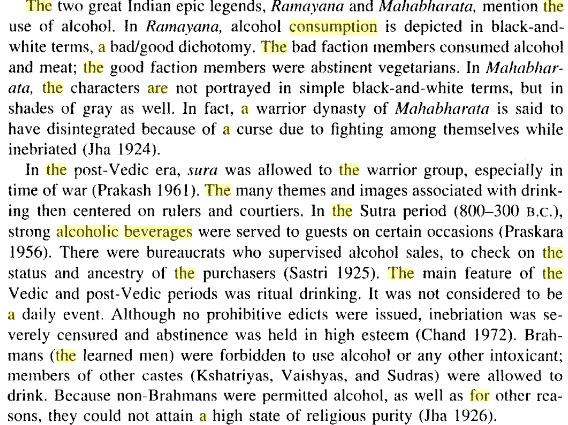 Consumption of alcohol is not recommended in Hinduism, but it is allowed for special occasions and occupations (allowed for all vernas Except Brahmans). Kshatriyas may and commonly do eat meat (though never beef), and many also take alcoholic drinks(mostly Wine and Spirits); both of these characteristics set them apart from the Brahmans. An alcoholic beverage is a drink containing ethanol, commonly known as alcohol. Popular Alcoholic beverages are wines, and spirits. (now a days Beer). Ayurveda, the medical branch of Hindu dharma, contains clearly defined views on the use alcohol. Ayurveda uses alcohol as a solvent for extracting the active ingredients of certain herbs. Tinctures are used in western herbalism in the same way. Ayurveda also prepares special herbal wines called asavas and arishtas. Herbal wines are regarded as particularly good medicines to take for a weak digestion and as relaxants for stress. Ayurveda recognizes that certain alcoholic beverages (like wine) can have health benefits, like improving digestion or circulation, but only taken in moderation. Alcoholic beverages that have a lower alcohol content (beer and wine) are produced by fermentation of sugar- or starch-containing plant material. Beverages of higher alcohol content (spirits) are produced by fermentation followed by distillation. Ayurveda also recognizes that excessive alcohol consumption can cause or contribute to physical or psychological diseases. Excess alcohol can damage the liver, make the blood toxic, and overheat the brain. Alcohol can impair our mental judgment as well as our sensory coordination. All Four Varnas in Hinduism - Brahman, Kshatriya, Vaishya, and Shudra. As far as Brahmins are concerned to drink Alcohol drinks. However, since Vedic times there have been special yajnas for Kshatriyas where drinking is done in a restricted way so as to allow them to indulge in their vices but in a controlled way. The Dharma shastras (law books) by default condemn alcoholism for any person regardless of occupation. However, in consideration of physical exertion and exhaustion of Kshatriyas and Shudras, alcohol is allowed for them to bring some relaxation and relief of pain. If based on Varnas people had any restrictions to consume Alcohol, it's not effecting the people who consume because it is purely interest matters. Not the answer you're looking for? Browse other questions tagged dharma caste-system kshatriya . What are the counter-arguments within Hinduism(scriptures) against the Birth based Varna and Caste system? Are som rasa and Madhu different kind of juices (alcohol?) or are they the same thing? What is the reason for metaphors relating to liquor being so frequently used in Hindu holy books? Is Hinduism a bit partial to Kshatriyas? What is the current status of the four varnas created by God? Which Kshatriya and Vaishya communities continue to wear the Yajnopavitam today? What are the duties of Dvija-Bandhus? Have there been instances of rivalry between Brahmins and Kshatriyas? Why did Shree Krishna have 16108 wives if Kshatriyas are only eligible to take a maximum of three wives? Can Kshatriyas teach Brahmanas some Brahma Vidyas?